Diamonds are gorgeous and of course expensive, so is it safe to buy a diamond online. Before we get into the details, we should clarify that the reference to online here, relates to a diamond blockchain. The Glitzkoin diamond blockchain is promoted by a veteran, from inside the 90 billion dollar diamond industry. CEO Navneet Goenka comes from a family, that has been in the glittering industry for around 5 decades. The project was conceptualized, by a team of diamond experts and tech pundits in the field of blockchain technology. Glitzkoin focuses on improving efficiency and market scope for the precious stone. The weaknesses in the supply chain for diamonds, have been clearly identified and addressed within the project. More importantly, emphasis has been given to rectify conventional practices that reduce buyer confidence and interest. The DiaEx diamond trading platform which is an important component of the project, allows buyers and sellers irrespective of their physical location and size, to operate directly on the platform. This eliminates the need for middlemen and thereby, removes the problem of price inflation and cloaking. Diamond buyers are often weary of receiving diamonds that, are substandard, fake or synthetic substitutes. Listings on the DiaEx diamond exchange, are limited to natural, certified diamonds. This rules out the possibility of trading in synthetics in fakes. Certification also ensures that, the 4Cs (carat, color, clarity and cut) of the diamond are defined accurately and without any bias. Buyers need no longer worry about the features of the stone being overstated. Since diamond sellers from across the globe list their diamonds on DiaEx, buyers have a wider selection of diamonds to choose from. Sellers who overprice their diamonds, will find it hard to get interested buyers. This obviously means that, buyers will have access to diamonds that are priced realistically. We could not end this report without mentioning about, the mode of payment when shopping for diamonds online. Payment for a diamond purchase can be substantially high, international banking procedures and expenses vary widely. Glitzkoin has leveraged the power of digital currencies to circumvent this problem. The GTN token has been designated as the mode of payment on the DiaEx diamond trading platform – no hassles related to multiple currencies and their conversion. 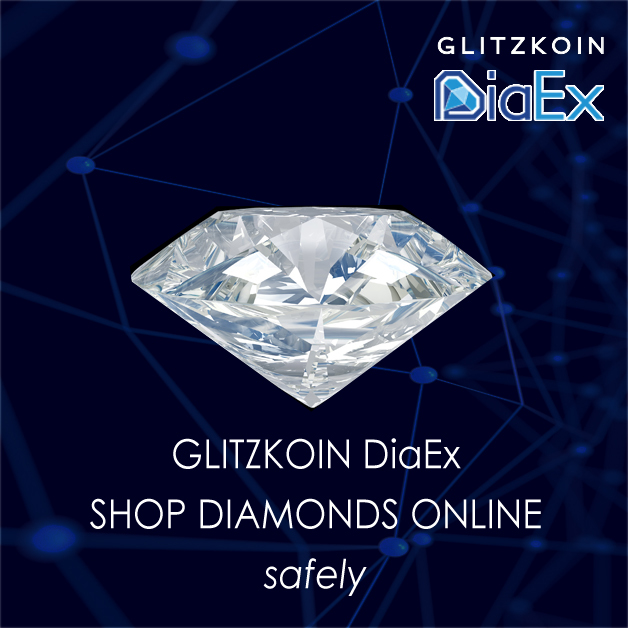 A diamond blockchain like Glitzkoin that, features a comprehensive B2B and B2C trading platform (DiaEx), takes online diamond trade to the next level. Glitzkoin Project Summary: Promoter and CEO Nanveet Goenka, comes from a family that has been an active player in the diamond industry for, over five decades. The features of the project were conceptualized, after a team of blockchain experts and diamond professionals, carefully studied the inefficiencies in the diamond industry. The scope for improvement was matched with the powerful properties of blockchain and digital currency. Glitzkoin is poised to improve efficiency and market scope, for the $90 billion industry. The project includes a comprehensive diamond trading platform – DiaEx, that supports B2B and B2C trade in the precious stone. The GTN token is the mode of payment on the DiaEx platform. It is interesting to see how the crypto community supported the Glitzkoin project and GTN token, all through the ICO and continue to do so until today. This was evident in the last few months of 2018 when, crypto markets crumbled with the tumbling price of Bitcoin (BTC). The GTN token surged to a record high of $0.30, adding a hefty 50% to its ICO price of $0.20.